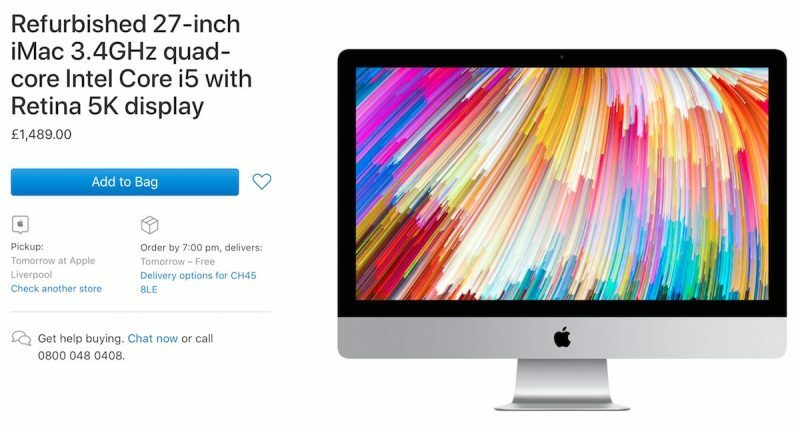 Apple quietly updated several of its European online stores for refurbished products over the last couple of days, and has added its latest 27-inch 5K iMac models to the discounted listings for the first time. The iMacs were first released in June of 2017 and feature Kaby Lake processors, faster SSDs, and AMD discrete graphics. Online stores in France, Germany, Ireland, Italy, and Spain have all been updated with the new stock, although the largest range of configurations currently appears in the United Kingdom. In the U.K., for example, an entry-level model with 8GB RAM, a 1TB Fusion Drive, a 3.4GHz i5 processor, and a Radeon Pro 570 is priced at £1,489, which is a £260 discount off the standard price. This is the first time the machines have been available in refurbished stores around Europe since their introduction at the 2017 Worldwide Developers Conference. Apple first began selling the refurb models in the U.S. and Canada back in August. In addition, Apple has boosted its European stock of refurbished 21.5-inch 4K iMacs, also released in June of this year. Apple has added a range of configurations, from low-end to top-of-the-line. As with all refurbished products, stock will fluctuate regularly based on the machines Apple is getting in for repair. All of Apple's refurbished products go through a rigorous refurbishment process before being offered for sale, which includes inspection, repairs, cleaning, and repackaging. Refurbished Macs come with a one-year warranty that can be extended with an AppleCare+ purchase. For more tips on purchasing a refurbished product, make sure to check out our guide. I'm glad they're expanding Refurbished products into Europe, but still no Refurb Macs here in the Netherlands.